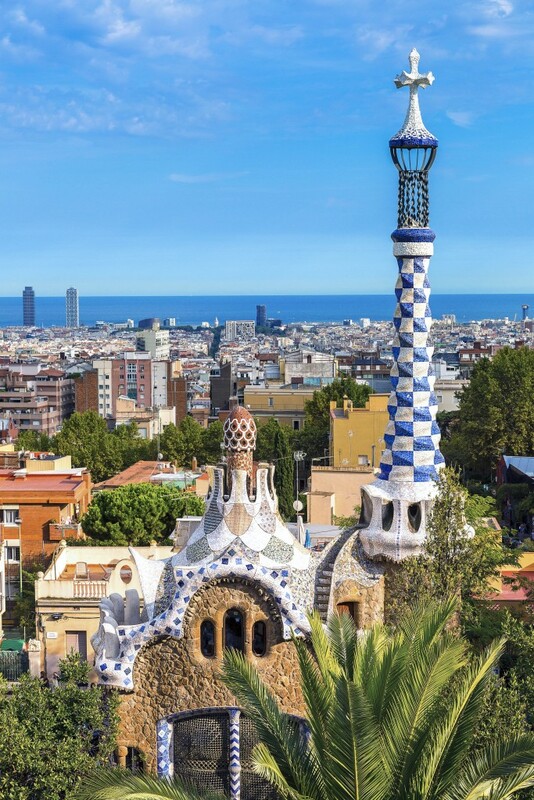 1 Day, 3 Ways: Discover Barcelona! minutes for a tour and be ready to fork out for a blue-and-burgundy replica shirt at the end. 12.00 Stop for coffee and churros (sugar- coated doughnutstrings), and save time by taking them on the Blue Route bus to Park Guell. This child-friendly introduction to the work of Antoni Gaudi – architect of the city’s world-famous Sagrada Familia church – calls for an I-Spy game. From the magical mosaic dragon and fairytale gatehouses at the entrance, to the curving serpentine benches at the top of a double staircase, it’s a surreal wonderland, with lovely views across to the sea. 14.00 Take the Blue Route bus to Plaça Catalunya where there’s a Hard Rock Café on the corner. 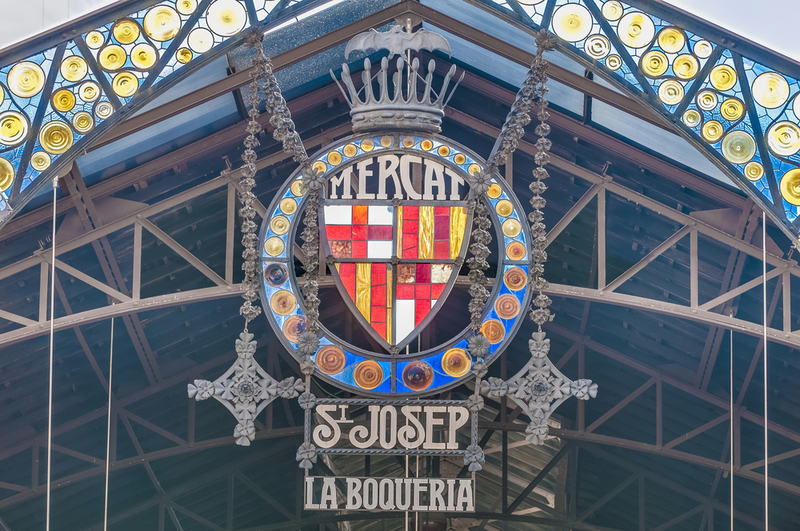 Then walk down La Rambla – the broad, tree-lined thoroughfare where musicians and mime artists entertain – to La Boqueria, where the most spectacular food market awaits. Each stall is a work of art, displaying meats, cheeses, honey, nuts, sweets, fruit and seafood. Around the edge of market are small cafes where huge pans of paella are cooked al fresco. Everyone can tuck in without breaking the bank. 15.30 It’s likely to be hot by now, so it’s time for a gentle amble in the shaded side streets of the Gothic Quarter, where boutiques sell handbags, trainers and trinkets. Teenagers will love it. 16.30 Here’s no direct bus to Barceloneta Beach so take the Red Route for Port Vell or Port Olympic. Both are vibrant marinas and great places to hang out with a long, cool drink before a stroll to the wide golden sands of Barceloneta Beach. The old fishermen’s quarter is now a lively spot with beach volleyball pitches and gyms, lounge bars for tapas and a lovely promenade. Swim, sunbathe and build sandcastles before grabbing a cab for a short ride to the ship, just in time to wave goodbye to this truly amazing city. 2. FIRST TIME IN BARCELONA? 9.00 Time will be tight so share a cab to Carrer de la Marina to see architect Antoni Gaudi’s Sagrada Familia – the amazing but still unfinished church that has become the city’s emblem. Its size can be overwhelming, so put the Passion and Nativity façades on your must-see list and take a lift to the top of the tower for a rewarding view of the city. If there’s cash to splash, book an individual 50-minute guided tour at sagradafamilia.org or through your ship’s excursion team. 12.00 Need a pitstop? There are tapas bars, dairy shops and cafés aplenty in the Gracia area, so t ake a break for refreshment before crossing the road to Casa Batllo. Here Gaudi converted an ordinary building into a fantastic, fairytale home, complete with a mighty dragon’s back façade. 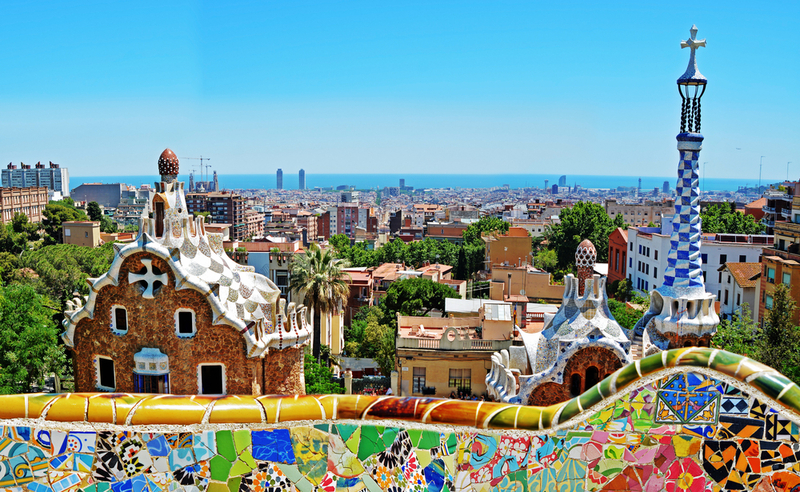 Unless you’ve been to Barcelona before, you’ve never seen anything remotely like it. 13.00 It’s time for window-shopping. Passeig de Gracia is home to designer houses from Salvatore Ferragamo to Jimmy Choo and Mandarina Duck. The further along it you walk, the more discreetly the prices are displayed. 14.00 Take the Metro to Jaume I station to explore the Old Town. 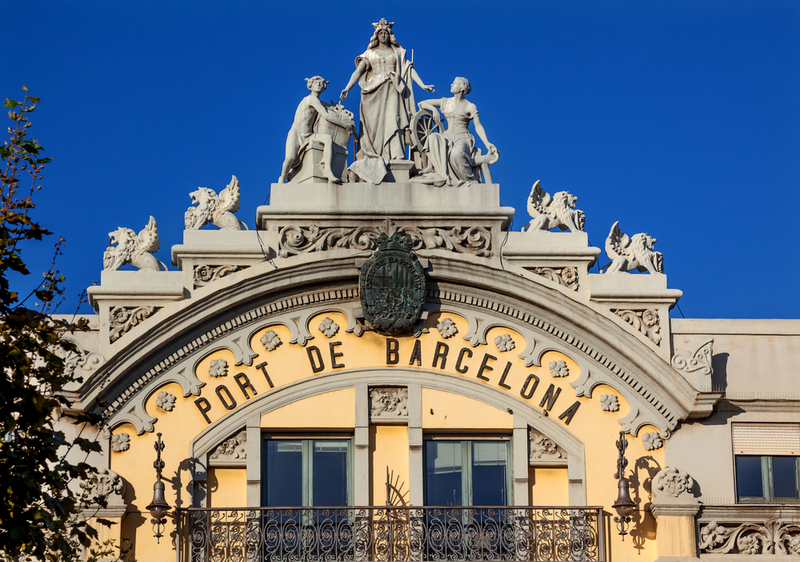 If you have time, take in a quick visit to Palau de la Musica Catalana, the Art Nouveau concert hall on Carrer de St Francesc, where the stained- glass inverted dome in the auditorium is adorned with angels’ faces. It will take your breath away. 14.30 For lunch, book a table at Els Quatre Gats. This famous café was the first place to show Picasso’s work and it became a hangout for the artist and his friends. 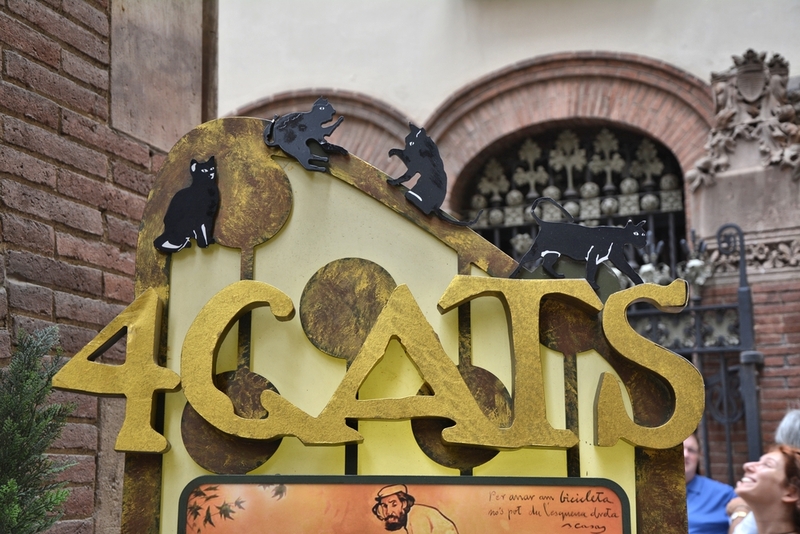 16.00 While on the subject of Picasso, duck into the welcoming cool of the Picasso Museum on Carrer de Princessa, which has a spectacular collection of work from the artist’s early years (entry is free on the first Sunday of each month). 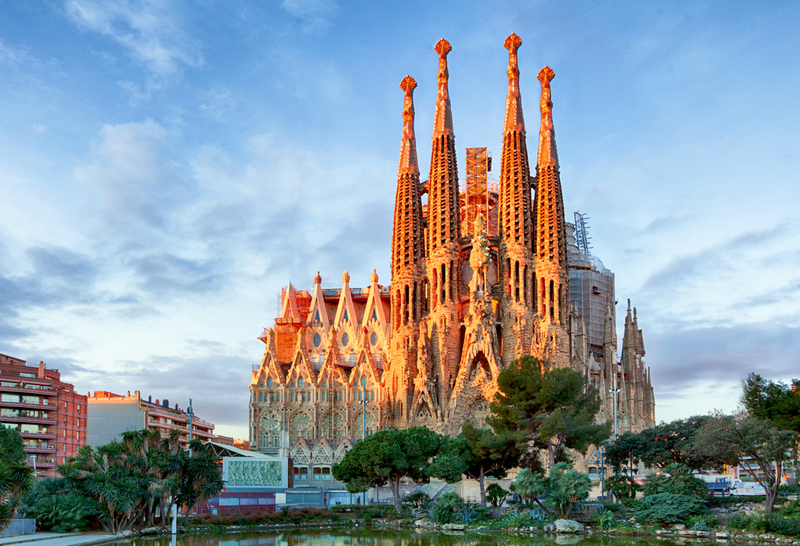 17.00 On the home straight, choose between a visit to the majestic Santa Maria del Mar church or the 14th century Barcelona Cathedral with its single nave that soars 26 metres into the heavens. ■ GRAB A CAB Take a taxi to the port and you’ll know you haven’t wasted a minute of your day. ■ TAKE THE TRAIN To find the Metro, look for a large red M on a white diamond. There are six lines, identified by number and colour. Tickets can be bought from a machine with cash or a credit card. 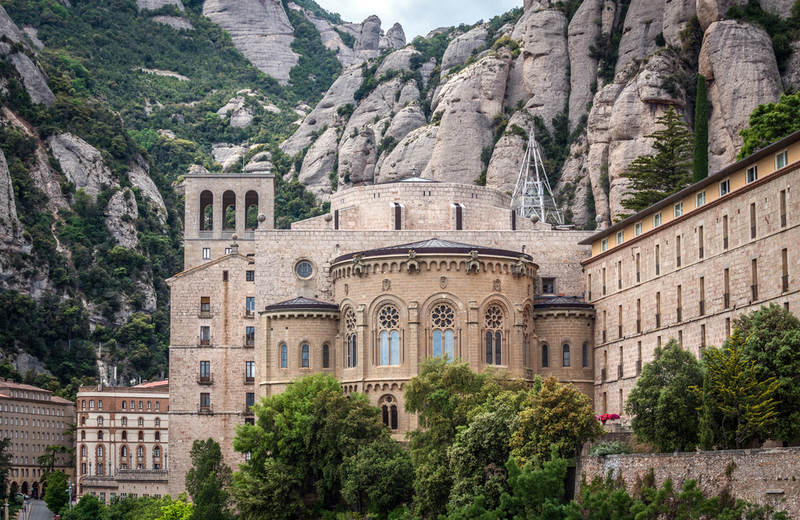 MONASTERY OF MONTSERRAT A neo-renaissance basilica in the spectacular mountainside setting of a National Park, surrounded by chapels and hermit’s caves, this pilgrimage site is revered for its Black Virgin statue. Benedictine monks still live in the monastery and visitors can hear the Escolania boys’ choir singing the Montserrat hymn “Salve Regina y Virolai” at 1pm and 6.45pm. However you choose to arrive – by foot, car, rack railway, cable car or cruise tour – you’ll find the journey is well worth every effort. TARRAGONA Cruisers interested in history should head south from Barcelona to this former Roman capital, where there is an important amphitheatre and circus. The nearby Museu Nacional Arqueologic is home to the best collection of Roman artifacts in Catalonia, and visitors can take a walk along the one-kilometre Roman ramparts. Tarragona is also a charming beach resort, with cobbled plazas, a lively café culture and atmospheric medieval quarter – all of which makes for a delightful away-day. FIGUERES AND THE DALI MUSEUM There’s no doubting if you’ve arrived at the right place when visiting Teatre- Museu Dali. The castle-like museum’s red outside walls, plastered with giant eggs and croissants, is every bit as bizarre as you’d expect from the 20th century’s master of surrealism. As the name implies, the museum was once a theatre, converted by the artist in the 1960s and now a shrine to his ever-controversial cult. Dali (19041989) was born and died in Figueres, and he is buried in the crypt under the stage. When you arrive, make a beeline for “Rainy Taxi“, a handsome Cadillac in the courtyard which is adorned by statues, but with a twist. Put a coin in the slot and the car’s passenger gets a soaking. Don’t miss the famous Mae West Room, or Dalí’s version of the Sistine Chapel, and find time to enjoy his paintings in the Fishmongers’ Hall, as well as the Dali Jewels – 37 eye-watering pieces made from gold, platinum and precious gems in the shape of hearts, lips, eyes, animals and mythical symbols. If there’s time on the return drive or train journey, stop in handsome Girona, where lovely buildings in pastel shades overlook the River Onya. In the Old Town, La Rambla de la Libertat is lined with cafés and bars for a tapas treat. ■ MONASTERY OF MONTSERRAT About an hour by train or car from Barcelona. See Barcelona-tourist- guide.com and abadiamontserrat. net for visiting times.